I’ve got to put my hands up and admit to being something of a philistine when it comes to breath-taking scenery. Sorry I can look at a snow-capped mountain range and think it’s nice, but not be inspired to write symphonies or get my crampons out and go climbing over them. The same can be said for the scenery of the west coast of Turkey, where, in May, I spent a week sailing with my wife Diana and a handful of complete strangers on a cruise in the Turkish Med. If, over the last couple of issues, you’ve been following what Martyn Lester and Rod Heikell have to say about sailing on the Turkish charter coast – or, indeed, if you’ve been here yourself- then you’ll know I’m doing the whole area a horrible injustice by merely saying it’s ‘nice’. I do, however, like to think of myself as something of an aficionado when it comes to having other people do everything for me and steer me around those little annoyances that get in the way of my search for hedonistic satisfaction. So I was especially pleased to be doing my sailing on the fully-crewed Black Sea schooner Amazon Solo, the flagship of the Vela Dare fleet of gullets based in Gocek, the major sailing centre at the head of Skopea Limani and the Gulf of Fethiye – although our boat’s opening turn-around was actually taking place in Marmaris. This part of the coast is served by the international airport at Dalaman, but we arrived by sea, because we’d planned our cruise to be in the middle of a trip to the nearby Greek Island of Rhodes. If I’d planned this it would have been fraught with mishaps and British farce stories of lost-luggage and midnight taxi dashes in pyjamas to catch ferries, so, thankfully, Diana took charge and the whole process of getting there turned out to be as easy as crossing the street. An hour-long ferry trip took us from Rhodes to Marmaris on the Saturday, and after a short hop in a taxi we soon found ourselves sitting relaxed in a swish marina bar waiting for the gulet’s crew to finish off cleaning and tidying up before welcoming aboard their next group of guests. Don’t waste too much time in the marina bars in Marmaris, though. For one thing, the prices are three or four times what you’ll pay almost anywhere else for a beer. For another there’s a lot going on in the narrow streets behind the marina, and if you’ve got a couple of hours to kill, as we did, you could do a lot worse than spend a leisurely time window shopping for souvenirs and gifts, and then getting up to the Castle Bar, in the highest part of Marmaris, where you can watch the world go about its business below. We embarked in the early evening and the captain Aslan introduces us to the rest of the crew – Imdat the chef, Aytekin the first mate, and deck hand Suleyman – after which we waited with mild trepidation for the rest of the guests to arrive. Vela Dare through their UK agents Tenrag, had assured us that when people opt for a cabin charter, as we had, they ask a few basic questions to try and ensure they’ve got the right mix of people so that the guests, who will be strangers to each other, will rub along OK during their time aboard. You can imagine the fun six members of a Teetotallers Society would have with half a dozen Rugby players! Space here is limited and I beg the forgiveness of the other members of the party on the boat if I limit my comments to the fact that they were a cracking bunch of people. Chuck and Karen were a few years older than my thirty-something and hailed from America, as did Shirley, who was there with her British husband John. Peter and Catherine only had a couple of years on me and were from London, and all got on well. We were under way only for a short time that evening, because we were to spend our first night anchored a short distance away in Marmaris Bay. That Saturday happened to coincide with Fenerbahce winning the Turkish football championship, so we spent part of the evening watching the fireworks go off, and the noise of some very happy Turks carry over to us from the marina until well into the night. When we all decided to retire the party was still in full-swing in Marmaris, but none of the hubbub penetrated to our spacious, not to mention luxurious double-cabin below. As the flagship of the Vela Dare fleet, the Amazon Solo will accommodate 12 people plus two children in its seven large cabins, each with ample stowage and an en-suite heads/shower compartment. There are a number of smaller gullets in the fleet if you’re more inclined towards something smaller than 32m (including bowsprit) Black Sea schooner. The food throughout the week was little short of excellent, and again, because space doesn’t permit me to give you an extensive list of all the varied and delicious meals we savoured, I suggest you check out the menus on view on the Vela Dare website. Suffice it to say that we ate a hearty breakfast and then motored to our first port of call, Ekincik. It took about an hour and a half to get there so, naturally, we stopped for lunch and a quick swim before boarding a small river boat that was going to take us up the Koycegiz River to the ruins at ancient Caunos. This was the first of two excursions we had during the week, and thankfully this one took place on the only overcast day, because even though the walks around the Roman, Lycian and Byzantine ruins were short, it was hot enough for everyone to be thankful we weren’t doing it in the blazing sun. The ruins and tombs were marvellous to behold and, unlike in England, you’re actually allowed to clamber all over them. We had an English-speaking guide with us throughout the afternoon, which was a real bonus, because so much has happened in this part of the world over the centuries. By the time we’d got back to the boat, by way of a small bar and a couple of the local Efes lagers, it was – yup, time foe dinner and a couple of bottles of the complimentary wine that came with each meal. Other drinks available on board were very reasonably priced, so after each meal we’d sample some of those too, though I never did get a taste for the Turkish brandy. The next day we were on our way again, under sail for some of the time, though there wasn’t a huge amount of wind to be found. The sails were ‘flopsy’ according to John, who insisted it was a Byzantine nautical term, but he was convincing no one. We anchored for lunch in one of the 40 odd bays in the Gulf ofFethiye and spent the rest of the day sunbathing, swimming and generally thanking our lucky stars for such good weather, good food and good company.We set off early on Tuesday and headed for Fethiye, where we entered the marina after breakfast for the second of our excursions ashore. A quick trip round the crowded town market for some bargains before we were all loaded up in an air-conditioned van and taken for lunch at Saklikent Gorge. The bravest among us (not me, I hasten to point out), hiked a few kilometres up the stunning gorge in the icy-cold mountain waters before returning, assuring me it was ‘character-building stuff’. The day was rounded off with a trip to a local carpet collective where some of our party were sorely tempted to purchase some magnificently beautiful carpets – unfortunately, they cost more than some second-hand yachts.And that’s basically how the week progressed. We’d wake up, swim, breakfast, motor or sail to some beautiful bay, eat again, swim in the lovely warm, sparklingly clear turquoise waters, sunbathe, take our poor, put-upon souls to the awning-covered dining area at the stern of the deck and read or gossip or paint or write or fish or sleep. Then we’d usually go to yet another idyllic and secluded bay and anchor for the night and eat and chat and laugh. Some of us outdoor types even took to sleeping on deck under the stars some nights (and I am including myself in this party), and not just, as was unkindly suggested, because it was less distance to walk to the breakfast table in the morning. To call the week luxurious would be about right. The crew waited on us hand and foot and were polite and courteous to a man. The sailing was great, with guests not having to lift a finger unless they wanted to – and could convince the Skipper Aslan they knew what they were doing. Obviously the weather makes a great deal of difference to a holiday and we were lucky to have gorgeous sunshine for 10 hours a day for six of the seven days aboard, but even if it hadn’t been so good I’m sure everyone would have had just as good a time. 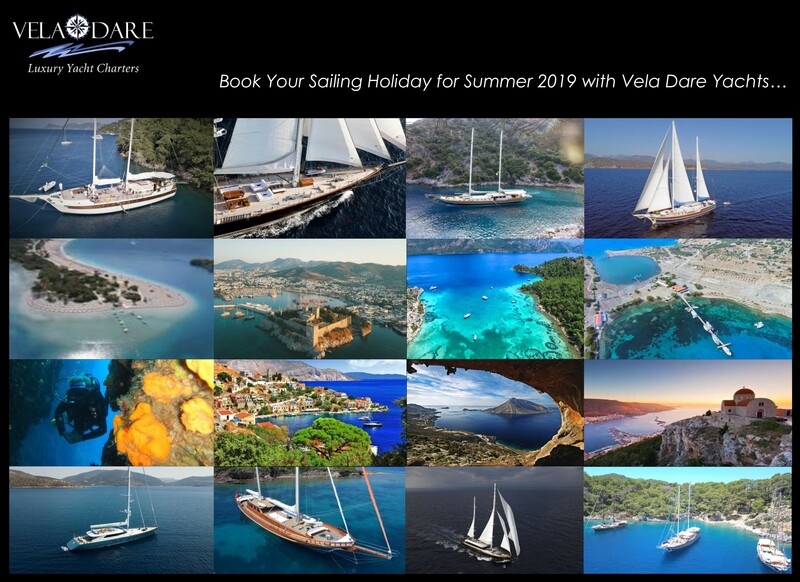 If you like being on the water (with a professional crew doing all the hard work), in a relaxed atmosphere with no overly strict itinerary to adhere to and don’t mind eating and drinking well to boot, you could do a lot worse than think about hiring a gullet and sailing up and down the Turkish coast for your next holiday. I’ve certainly been recommending it to friends and am definitely considering doing it all over again. The scenery’s nice too. A guest writes…It’s all very well me telling you what it’s like on the Amazon Solo, but what did the others think? Here’s what Chuck said:“I was amazed with the quality of the food, it was gourmet level. The staff on the Amazon Solo were outstanding always there to be of service, yet not intrusive. The route chosen by the captain brought us within sight of countless ruins, and easy hikes to many of them. Turkey turned out to be a very clean country, with very friendly people. All in all, I was extremely pleased with the vacation. Very restful yet exciting, with wonderful people on the boat to share it with. ”And here’s what Diana said:“ Oh please, oh please, oh please – can we go again next year? ”Unsure about sharing a boat with a bunch of strangers?